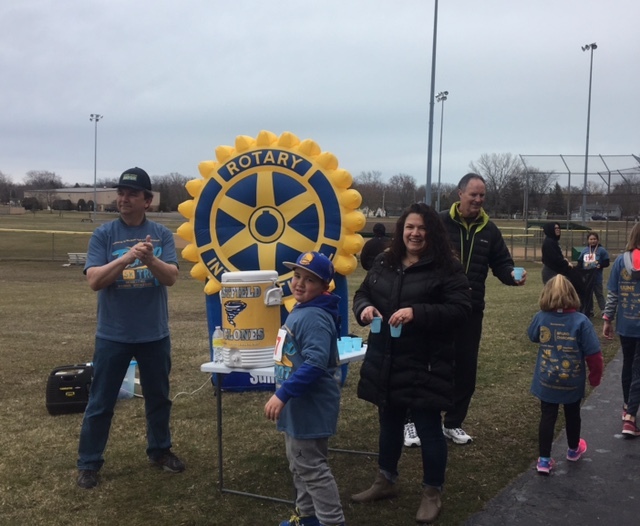 The mission of the Illinois Beach Sunrise Rotary Club is to subscribe to the principles of Rotary International to provide humanitarian service, encourage high ethical standards, and help build goodwill and peace in the world. Our primary goal is to support and promote youth programs locally and nationally, as well as through international partnerships. In addition, the club provides human and financial resources to community based service organizations and municipal governments. Watch for details of the 19th Annual Jack McElmmrry Golf Outing coming May 17, 2019!! Mark your calendar to reserve this date for GOLF FUN!! Contact any club member to enter a foursome for golf or to become a hole sponsor. An updated registration form will be available on our home page file downloads section next April. Hope to see you there!!!! Working with Operation Warm our Club was able to donate coats to students in need in our Beach Park, Winthrop Harbor and Zion Communities. Rotary District Governor Julie Clark visits club. Don't miss this important guest speaker. Our 6th annual World Polio Day event will take place at the College of Physicians in Philadelphia, Pennsylvania. Find out how you can take part in World Polio Day, and watch last year's livestream program featuring global health experts and celebrities sharing our progress on the road to polio eradication. Club President Donna Linder treated our exchange student from Spain Maria and her host sister Ky-Leigh to a train trip to Chicago. While in Chicago they went on a bus tour of the city and visited Navy Pier. What a great day for the Rotary Club of Illinois Beach Sunrise! Central Junior High in Zion is collecting water donations which are beings shipped to Puerto Rico and the U.S. Virgin Islands. Rotary District 6440 Governor Donald Brewer & wife along with Assistant District Governor Danny Rodriques, Waukegan Rotary President; inducted three new members into the Rotary Club Of Illinois Beach Sunrise during his annual visit this morning. Joining the club are Tonya Housing, principal at Central Middle School, My Fathers Business as our first corporate member Randy Thornton(pictured), Matt Thornton and Lori Villalobos representing My Fathers Business as our first corporate member and Romario Avila. Today the Rotary Club of Illinois Beach Sunrise gathered at the home of Bob and Liz Grulke for our weekly meeting. 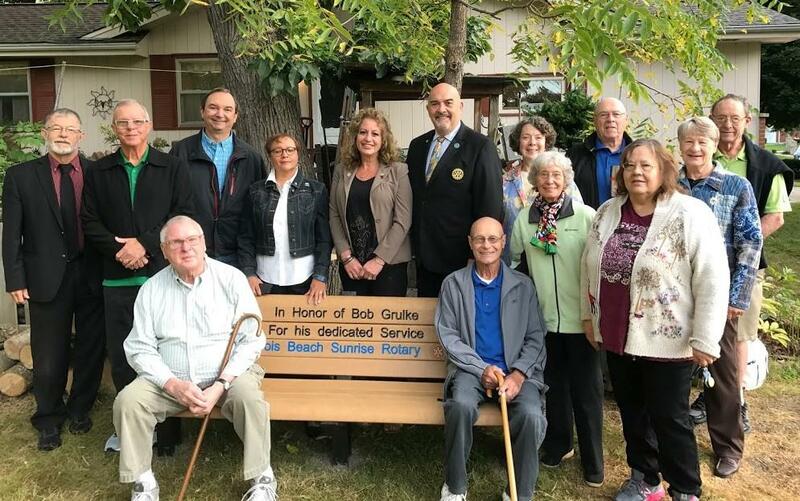 The purpose of this meeting was to dedicate a bench the club had installed in Bob's garden to honor him for his 50 years of Rotary Service. Bob joined the North Chicago Rotary Club in 1967. He led the effort to charter the Illinois Beach Sunrise Club in 1999. Bob and Liz have hosted more than 40 exchange students, most through Rotary. They’ve been active participants in the U.S. Golfing Fellowship of Rotarians and the International Golfing Fellowship of Rotarians. Bob's dedication to Rotary and the motto "Service Above Self" is an inspiration to us all. Thank you Bob for your dedication and service. Our Club recently participated in the 69th Annual City of Zion Jubilee Days Parade. Club members Bill and Debbie Kolb constructed the float with the help of family. Have a project you would like help funding? All Illinois Beach Sunrise Rotarians are now Paul Harris Fellows. President Dennis presented pins and certificates to John Ahlgrim, Brian Curtin, Shantal Taylor, Mike Alexander, Chris Clark, and Syndy Nugent. 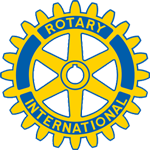 To get more information about becoming a member of the Rotary Club of Illinois Beach Sunrise Club - join us for one of our meetings!